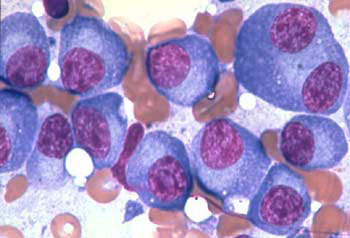 Myeloma cells. An antibody treatment against multiple myeloma, elotuzumab, has shown high response rates in recent clinical trials. An emerging antibody treatment for multiple myeloma shows high response rates in clinical studies. The results for a critical phase I study of elotuzumab, when used in combination with lenalidomide and dexamethasone, were published online this week by the Journal of Clinical Oncology. The lead author is Sagar Lonial, MD, professor of hematology and medical oncology at Winship Cancer Institute of Emory University and director of translational research for Winship’s B-cell malignancy program. Elotuzumab is an antibody that targets a protein (CS-1) that is found abundantly on multiple myeloma cells but not on the surfaces of healthy cells. Antibodies are proteins produced by the immune system, adapted for use as drugs (anti-cancer examples include rituximab, cetuximab and trastuzumab). For years, multiple myeloma, a cancer of cells in the bone marrow, was treated with chemotherapy and/or bone marrow transplant and prognosis was grim. In recent years, newer drugs such as lenalidomide and bortezomib have emerged as effective treatments. Together with transplant, these drugs have changed the natural history of myeloma resulting in longer survival times for most patients. Access to specialized myeloma care, clinical trials, and teams that focus on long term myeloma outcomes are critical to this process, Lonial says. The study in the paper began in 2008 and enrolled 29 patients with advanced multiple myeloma who had already been treated with standard therapies. Their treatment was elotuzumab in combination with the standard treatments of lenalidomide and dexamethasone. Among all the patients enrolled, 82 percent had a partial response or better, and 95 percent of patients who had not been exposed to lenalidomide before had a partial response* or better. This response rate is markedly higher than what was observed in previous studies with lenalidomide and dexamethasone (around 60 percent). After 24 months, 70 percent of patients had their disease remain in remission. “Elotuzumab-related toxicities observed in this study appeared to be primarily infusion related and were generally mild to moderate and resolved within 24 hours with or without treatment,” the authors write. The patients came from medical centers in Georgia (Emory), Missouri, New York and France. The study was supported by Abbott Biotherapeutics, which manufactures elotuzumab. Laboratory studies suggest that elotuzumab and lenalidomide could be attacking multiple myeloma in complementary ways. Researchers believe that elotuzumab guides the patient’s immune system to kill the cancer cells, while lenalidomide boosts the activity of the “natural killer” cells that carry out the antibody-targeted killing. Results for a phase I study of elotuzumab with bortezomib were reported in the Journal of Clinical Oncology in January. In addition, the results for a larger phase II study of elotuzumab, lenalidomide and dexamethasone were reported at the American Society for Hematology meeting in December 2011. Two phase III trials involving several hundred patients are now underway. One is for newly diagnosed multiple myeloma and one is for relapsed or refractory disease. Lonial is a paid consultant for Bristol-Myers Squibb, which is developing elotuzumab in cooperation with Abbott. *A partial response is defined as more than 50 percent reduction in the levels in the blood of a characteristic protein produced by multiple myeloma cells.